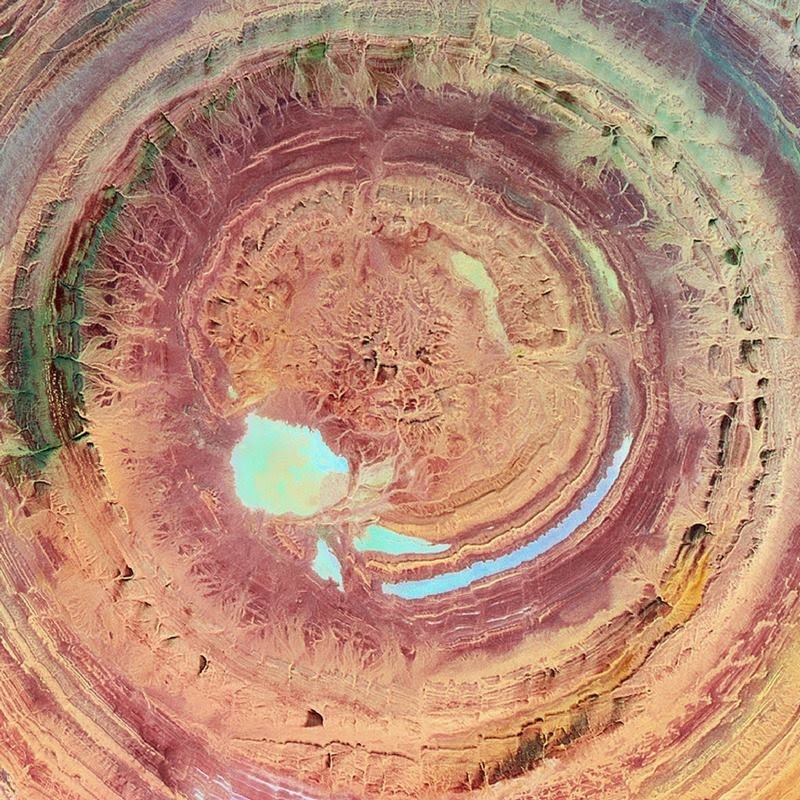 The Richat Structure, also known as the Eye of the Sahara and Guelb er Richat, is a prominent circular feature in the Sahara desert near Ouadane, west–central Mauritania. 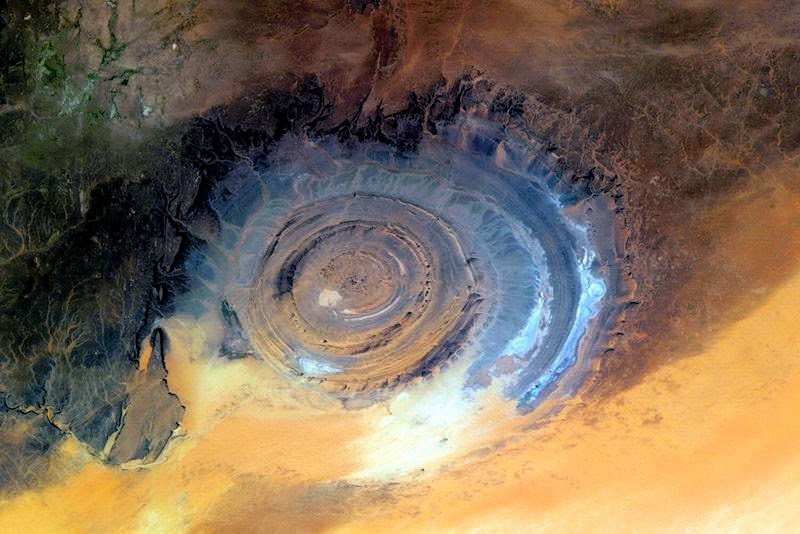 This structure is a deeply eroded, slightly elliptical, 40 km in diameter dome. The sedimentary rock exposed in this dome ranges in age from Late Proterozoic within the center of the dome to Ordovician sandstone around its edges. The sedimentary rocks comprising this structure dip outward at 10°–20°. Differential erosion of resistant layers of quartzite has created high-relief circular cuestas. Its center consists of a siliceous breccia covering an area that is at least 3 km in diameter. 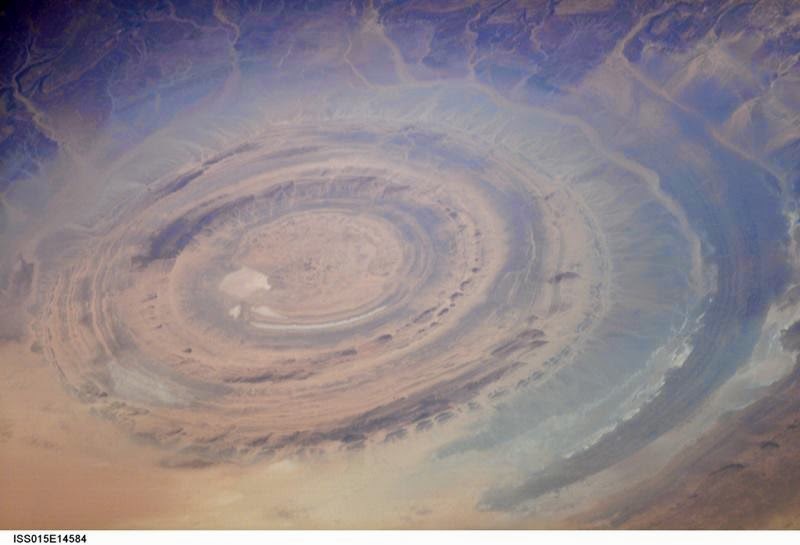 Exposed within the interior of the Richat Structure are a variety of intrusive and extrusive igneous rocks. They include rhyolitic volcanic rocks, gabbros, carbonatites and kimberlites. The rhyolitic rocks consist of lava flows and hydrothermally altered tuffaceous rocks that are part of two distinct eruptive centers, which are interpreted to be the eroded remains of two maars. 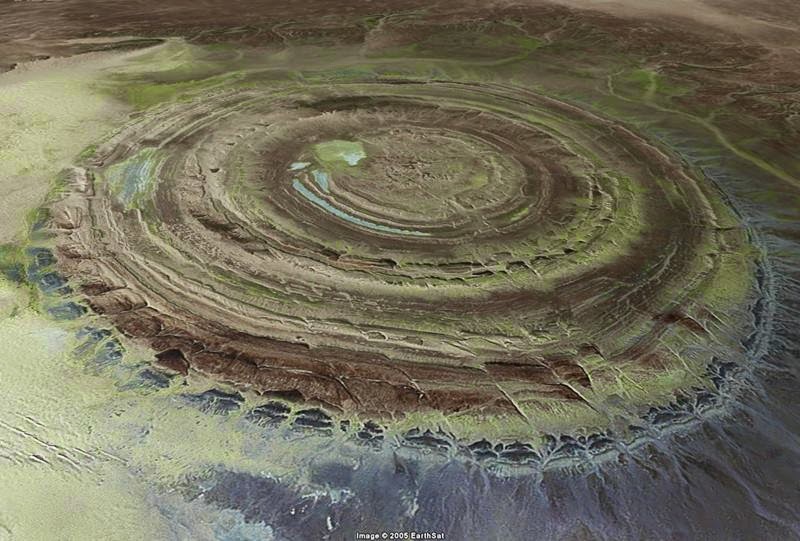 According to field mapping and aeromagnetic data, the gabbroic rocks form two concentric ring dikes. 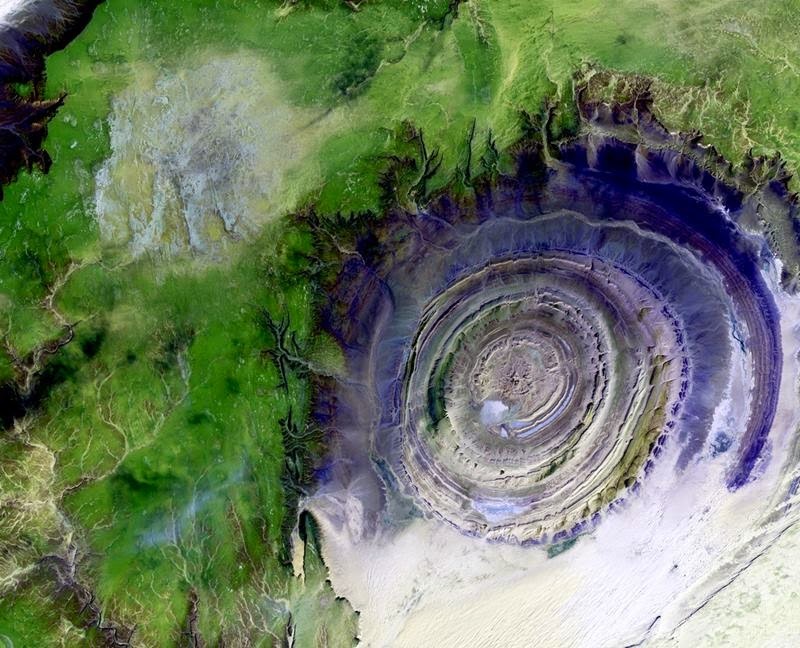 The inner ring dike is about 20 m in width and lies about 3 km from the center of Richat Structure. The outer ring dike is about 50 m in width and lies about 7 to 8 km from the center of this structure. 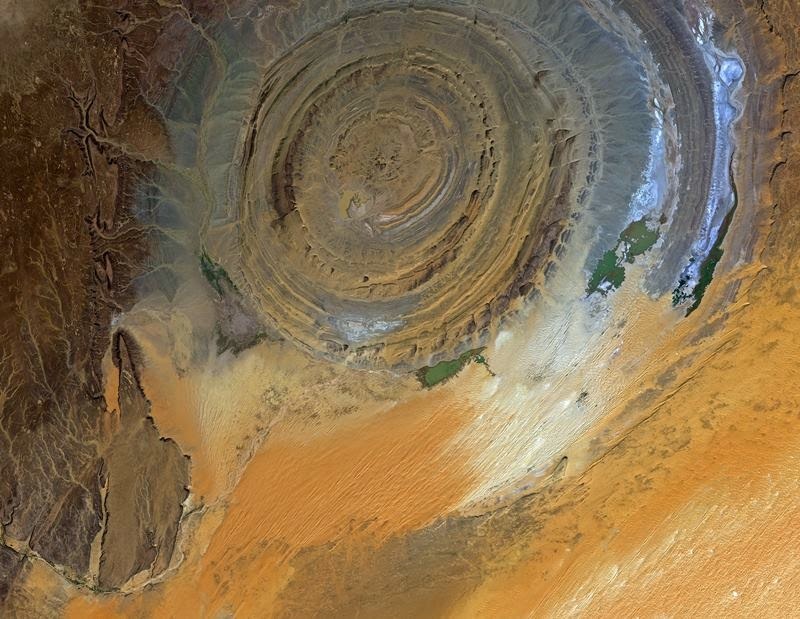 Thirty-two carbonatite dikes and sills have been mapped within the Richat Structure. The dikes are generally about 300 m long and typically 1 to 4 m wide. They consist of massive carbonatites that are mostly devoid of vesicles. The carbonatite rocks have been dated as having cooled between 94 to 104 million years ago. 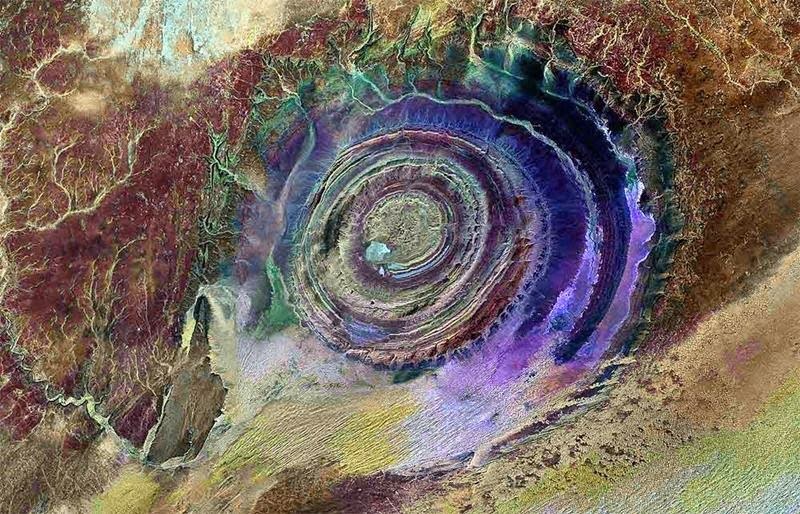 A kimberlitic plug and several sills have been found within the northern part of the Richat Structure. The kimberlite plug has been dated being about 99 million years old. These intrusive igneous rocks are interpreted as indicating the presence of a large alkaline igneous intrusion that currently underlies the Richat Structure and created it by uplifting the overlying rock. 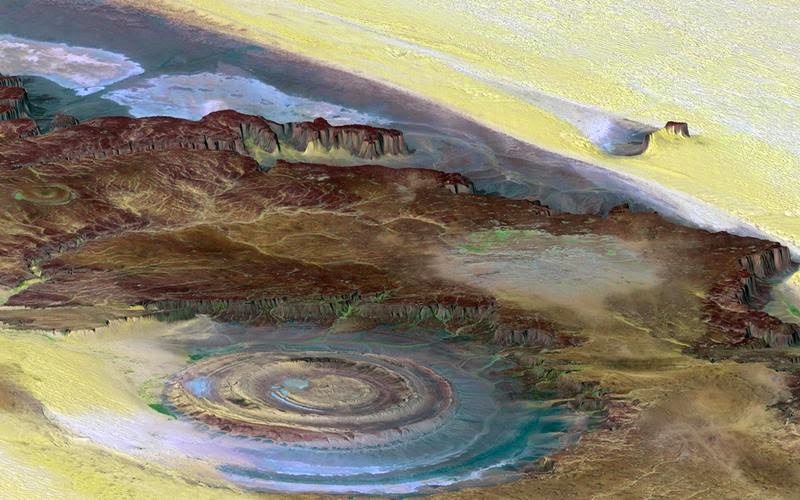 Spectacular hydrothermal features are a part of the Richat Structure. They include the extensive hydrothermal alteration of rhyolites and gabbros and a central megabreccia created by hydrothermal dissolution and collapse. The siliceous megabreccia is at least 40 m thick in its center to only a few meters thick along its edges. The breccia consists of fragments of white to dark gray cherty material, quartz-rich sandstone, diagenetic cherty nodules, and stromatolitic limestone and is intensively silicified. The hydrothermal alteration, which created this breccia, has been dated to have occurred about 98.2 ± 2.6 million years ago using the 40Ar/39Ar method.